Thanks to its well-balanced volumes, adapts to different sized settings in a host of different styles. Made of solid wood and multilayer wood with elastic strips. Joints between the various components by means of “fork” mechanism. The standard seat padding of this model is in feather. Available on request in Air soft version. Sofa legs in wood, metal painted or leather covered legs. Fabric and leather covers are fully removable. Sofas can be made in separate elements with one cover, please specify if needed. 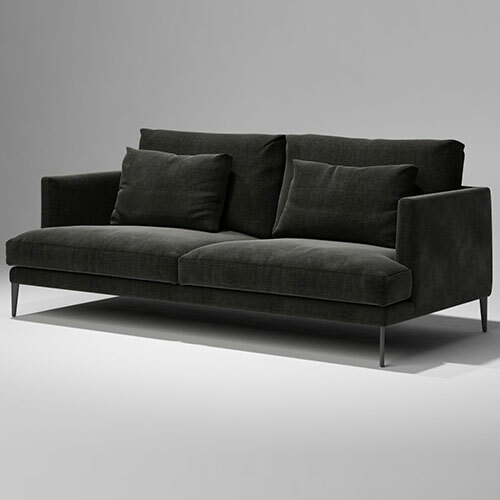 The Collection includes: Paraiso sofa with a 39″ or Paraiso plus sofa 34″ depth. Made in Italy. Please inquire for full list of finishes.